Monkeys, pigs, rats, mice, cats, sheep, beagles and countless other animals are considered nothing more than living test tubes. Millions and millions of them are burned, mutilated, hit on the head, and have other horrific and painful things done to them. But doesn’t all this suffering result in “good” science? For the most part, no, it doesn’t. Animals are not even good models for the human body. There are other, more modern and precise models for experimentation, from computer simulators to tissues and cells cultures. Time and again, animal experimentation has failed us. 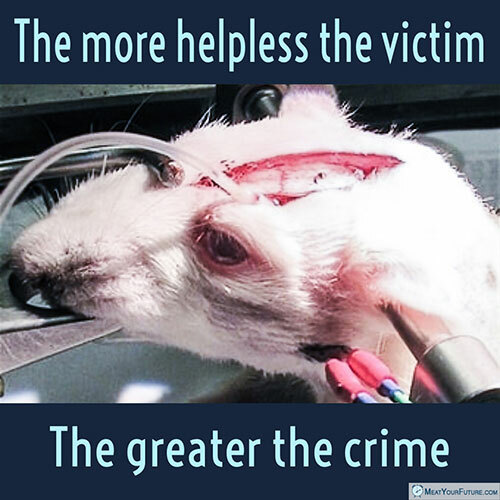 And, even if in some narrow areas where it has resulted in some useful knowledge (although it generally doesn’t), it is not morally justifiable to violate the fundamental rights of *any* non-consenting individual in painful or other scientific experiments – be they human or nonhuman. Would it be okay to experiment on a mentally disabled human just because they are different or don’t have the same intellectual capacity as most humans? Of course not. Other beings, human or nonhuman, are not for us to exploit just because they are different or supposedly less intelligent. Our duty is to protect the vulnerable, including animals, not harm and exploit them. Please pay attention and boycott those products that are tested on animals. Please also do what you can to raise awareness of these issues, and please live vegan. It’s the very least we can do. The Purpose of an Elephant is to Work in the Logging Industry? Should You Be Eating Fish? What is the Real “High Quality” Protein? Is Fish a Health Food, or Have We Just Let It Off the Hook? Upset at Canada Goose But Still Not Vegan? What Are *You* Doing to Minimize Your Footprint on the Planet?